This is a book for working women and mothers who are ready to release the culturally inherited belief that their worth is equal to their productivity, and instead create a personal and professional life that's based on presence, meaning, and joy. As opposed to focusing on "fitting it all in," time management, and leaning in, as so many books geared at ambitious women do, this book embraces the notion that through doing less women can have-and be-more. Each chapter gives the reader a small experiment to try and see what would happen if she did less in one specific way. So, rather than approaching doing less as an entire life overhaul (which is overwhelming in and of itself), this book gives the reader bite-sized steps to incorporate over time. 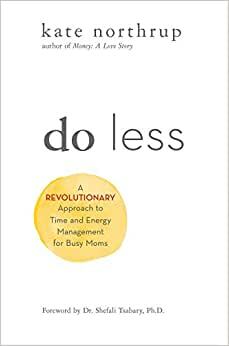 Start reading Do Less on your Kindle in under a minute. A practical and spiritual guide for working mums to learn how to have more by doing less. As an entrepreneur, best-selling author, mother, and activist, Kate Northrup supports ambitious, motivated, and successful women to light up the world without burning themselves out in the process. Committed to empowering women entrepreneurs to create their most successful businesses while navigating motherhood, Kate is the founder and CEO of Origin Collective, a monthly membership site where women all over the world gather to achieve more while doing less. Her work has been featured by the TODAY Show, Yahoo! Finance, Women's Health, Glamour, and The Huffington Post, and she's spoken to audiences of thousands with Hay House, Wanderlust, USANA Health Sciences, and more. We need to revolutionize the way we work. It’s not acceptable to work ourselves to the bring of exhaustion, to constantly be 'on-call' and checking our work e-mail around the clock. Because the only way to create a new system is to be it. 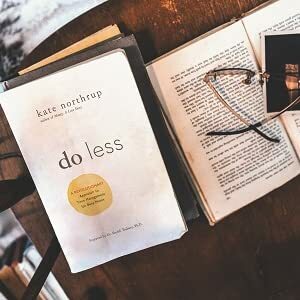 Instead of 'leaning in,' and 'doing it all,' entrepreneur and best-selling author Kate Northrup invites you to experiment with doing less. By doing less, paradoxically, you can have – and be – more. Over the years, I've learned that choosing a "do less" approach isn't about giving things up. It's about getting clear on what matters most, feeling restored in your body and rooted with what you have to contribute to the world. If you're someone who's tired of feeling overwhelmed, averse to the word hustle and all it requires, and is looking for a way forward that feels aligned with who you are, read this book. Kate's practical guide offers insight from her own experience, plus plenty of ideas for how to integrate this mindset into your day to day, no matter your circumstances. I lOVE this book. It is revolutionary. Imagine a time management system that relaxes your body and soul and mind and in so doing makes you more effective! I have been practicing Kate's Do Less system from her online material and it has transformed my life, my sleep and settled my nervous system. I am so excited to have this book in my hands. I am a busy mother and I coach busy mothers to listen to their body's cues and their intuition as they mother. This book is going to to take my work with mothers to a whole new level. I have no more guilt about "not doing enough" each day. That's a miracle. I can't wait to share this book with my clients. I adore Kate Northrupp and all her work, this book is no exception! She has a gentle, kind and wise way of helping you in simple, yet profound ways. 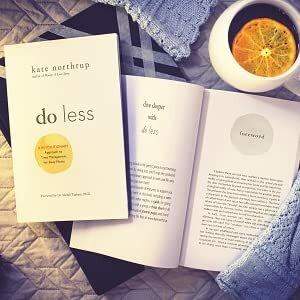 Do Less is a book and a life philosophy that has changed the way I mother, run my business, and most importantly: view my worth in this world. This book weaves practical advise on managing your time and energy with personal stories that feels accessible to actually do while managing a household. I highly recommend this book to any mother or caregiver who is struggling to find time for herself and her dreams. 5.0 out of 5 starsTruly life GIVING! This book comes at a time when we know there is more to being in the world than DOing #allthethings, and Kate shares what this actually looks and feels like and provides actual ways and “experiments” to help you embody what it truly means to be Mother and Woman and Dog Mom and Sister and Busiess Owner in a way that leaves you feeling filled up and content rather than strung out and looking for your next “hit” of “busy.” Truly life changing.